New stock arriving shortly! Order now, quantities limited! Each sparrow trap comes with a template and a complete set of instructions for mounting in any of the different styles of nest boxes. Once you do one nest box, the next ones will go much easier. 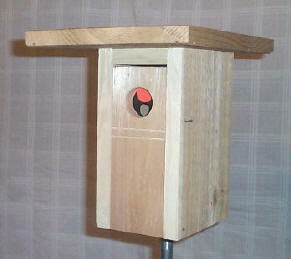 Open nest box door and lay pattern on inside of door with edge marked “Top” towards the hole. Holding pattern centered on door and about ¼ inch down from bottom of entrance hole, mark on cross hairs with an awl or sharp nail where the two screws are to go. 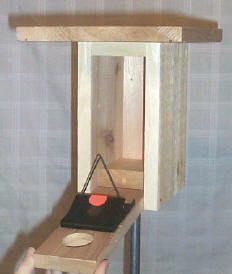 Step #2: Arm the trap - Slide sparrow trap on screws, set trap and gently close door. Step #3 - Monitor the trap! When the sparrow enters, it will trip the trap and the orange dot will show (as shown in photo). 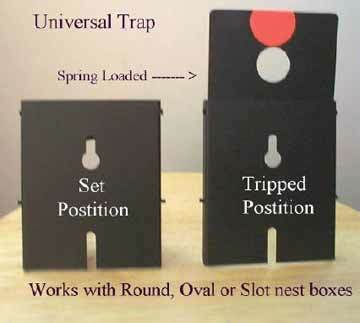 When you set this sparrow trap or any other trap, you must monitor the nest box within 30 to 60 minutes. This is very important to avoid trapping Bluebirds or other native cavity nesting birds! This trap is a no-kill trap - the trap itself does not harm the birds - but a trapped bird can die inside a nestbox if not removed within a short period of time. Never, ever, leave a nestbox trap armed and unattended! Screws should be left in the nest box. 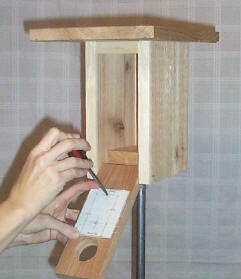 If you have more nest boxes, pre-install the screws in all boxes so you will be ready for the nesting season. Should you need to place the trap in the nest box.